Position an oven rack in the top of the oven, and preheat to 450 degrees F. Line a rimmed baking sheet with foil, and brush with oil. 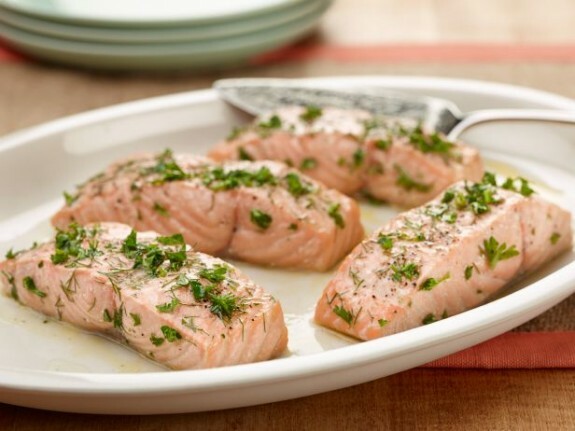 Place the salmon fillets, evenly spaced, in the middle of the prepared baking sheet. Sprinkle the tops with 3/4 teaspoon salt and a few grinds of pepper. Bake until the outside is opaque and slightly firm to the touch and the inside flakes easily (insert a small paring knife between layers to check; the color will vary from bright pink (rare) to pale pink to orange (well-done)), 8 to 12 minutes, depending on the desired doneness. Remove the fillets from the oven, top each with a piece of butter and let melt over the top and down the sides. Sprinkle with herbs, lemon juice and salt to taste. Transfer the salmon to serving plates with a spatula. Serve hot or at room temperature.